Patient was treated last year in september, 3000 grafts over 2 consecutive days. 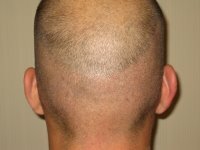 He has diffuse hairloss. 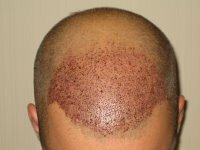 Eventhough we recommended taking propecia he stopped doing a couple of months after his session. The area was a little short of 100 cm2, obviously not high density. Still the patient is extremely happy. There where not after OP complication, no pain, nobody has found out since the healing was amazingly fast. He still has all options to either wear his hair short or long. » stopped doing a couple of months after his session. » The area was a little short of 100 cm2, obviously not high density. » He still has all options to either wear his hair short or long. Looks pretty good, I think you need about 100 more right in the middle of your hairline. Thank you for the kind words, i never ever thought I would read good comments about our work from you. As for the buzz cut before : we have no control over how patients hair looks when they come in. » comments about our work from you. » looks when they come in. I think it is undeniable that the non transplanted areas seem to have improved as much as the transplanted area acording to the intra-op pic??? » improved as much as the transplanted area acording to the intra-op pic?? ?